"Nothin's Wrong, 'cept Nothin's Wrong"
Best Movie of '08 = Rambo? Sometimes you have to revisit a movie to really appreciate it. 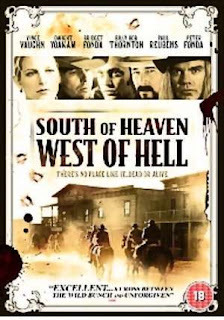 Back in ‘01 or so, I read about Dwight Yoakam writing, directing, and starring in a western called South of Heaven West of Hell. I picked it up on DVD along with the soundtrack CD and remember thinking it was alright for what it was, but a little weird and slow paced and didn’t really get it. I did however enjoy the soundtrack. Then the DVD sat on on my shelf in my collection for years and didn’t really watch it much until recently, being on a bit of a Yoakam music kick, I pulled it off the shelf and ripped it to my PSP and watched it over a week at work on my breaks. This time around, I totally got it and thoroughly enjoyed it and think it a great little overlooked movie. This movie probably isn’t for everyone (Amazon’s reviews seem to be either one or five stars, nothing in between), but in a sea of remakes, blatant Oscar grabs, and tired retreads, it is somethings thats original. It is a crude and violent movie with some slow points and bizarre moments, but it’s also genuinely funny in spots, brings some good action in the final shootout, and has some excellent lines. There was one scene that had me laughing so hard I had tears in my eyes - at work, no less. And if you’re paying attention, it’s got more to it story wise than your standard shoot ‘em up western. Think Eastwood’s High Plains Drifter and you know what level you’re on here. Verdict: I’d definitely recommend it for those looking for something way off the beaten trail and the patience for a slow moving character story. And if not, the soundtrack is worth a listen anyway. Comments on "Me Mini Movie Reviews: South of Heaven West of Hell"
The Texican: Has the site always looked this way to you? Or is this something recent that changed? The site looks fine here, for what it's worth. I saw this movie not too long after its DVD release. Bits of it have stayed with me, and wander into my mind every once in a while. I didn't know what to think about it the first time I watched it; so, before it had to be returned, I watched it again. Definitely sideways, but that's not a bad thing. Texican: I tried out my blog on several different browsers - I use Safari and Firefox and it looks fine, but on Internet Explorer it does look like crap. Thanks for the heads up, I'll have to look into it. Keanan: Definitely sideways really does sum it up. And it's not a bad thing.